COPD and asthma have similar signs like shortness of breath, but they are different conditions. Learn the table and two videos for a detailed comparison. COPD stands for chronic obstructive pulmonary disease, which is made up of medical conditions that involve progressive inflammation and decreased airflow that gets worse over time. Chronic bronchitis and emphysema are two forms of COPD. Although COPD and asthma may share some symptoms, including shortness of breath, and both impact the lungs, there are a number of differences. Differences between COPD and asthma include who is affected, how they affect the lungs, and their causes. There are millions of people in the US who have undiagnosed COPD, either because they have been misdiagnosed with bronchitis or asthma or have not been diagnosed at all. A big difference is that those with COPD usually have to take treatment every day and are almost never without symptoms. People with asthma can often go for some time without symptoms or the need for treatment. Asthma attacks can usually be prevented by avoiding the triggers that cause them. COPD flare-ups cannot easily be avoided. Acute asthma attacks are common. People suffering from COPD tend to have constant symptoms that get better with treatment. Besides wheezing, tightness in chest, shortness of breath, the patients also experience lack of energy, frequent respiratory infections and unintended weight loss (in later stages). When people with asthma have acute symptoms, they generally include feeling short of breath, tightness in the chest and wheezing. Some have a persistent, dry cough that is worse at night and in the morning. This cough is often brought on by humid or cold air, perfumes and other smells, exercise, or allergies. The difference between COPD and asthma is that it generally helps to bring up mucus and sometimes involves wheezing. For those with severe COPD, even regular activities can make it difficult to breathe. Coughs with asthma usually do not bring up mucus and almost always include wheezing. Treatment can not completely reverse lung damage or give back lung function. Treatment can help prevent more damage to lungs and control symptoms. Significant improvement with short acting Beta2-agonists is common. Lung function may be partially reversed with treatment. Although there is no cure for asthma, treatment can control symptoms. Asthma tends to change over time so talk to your doctor when symptoms change so that treatment can be altered and remain effective. Some individuals have both COPD and asthma. Some adults who suffered from asthma or had symptoms similar to asthma that ended up getting better may be diagnosed with COPD after being exposed to work hazards, fumes within the environment, being exposed to smoke, or smoking tobacco products themselves. There is some research that suggests that those people with asthma may be more likely to develop COPD. It is important to ask your doctor why you have been diagnosed with COPD and how your treatment is different than that of asthma. 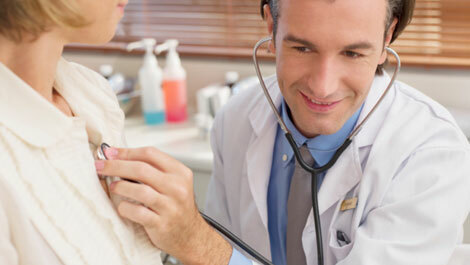 A lung test known as a spirometry may be performed in order to measure your airflow. Keep in mind that treatment for COPD should begin as early as possible in order to reduce your symptoms and give you a better quality of life. The following two videos help you better know the difference between COPD and asthma.